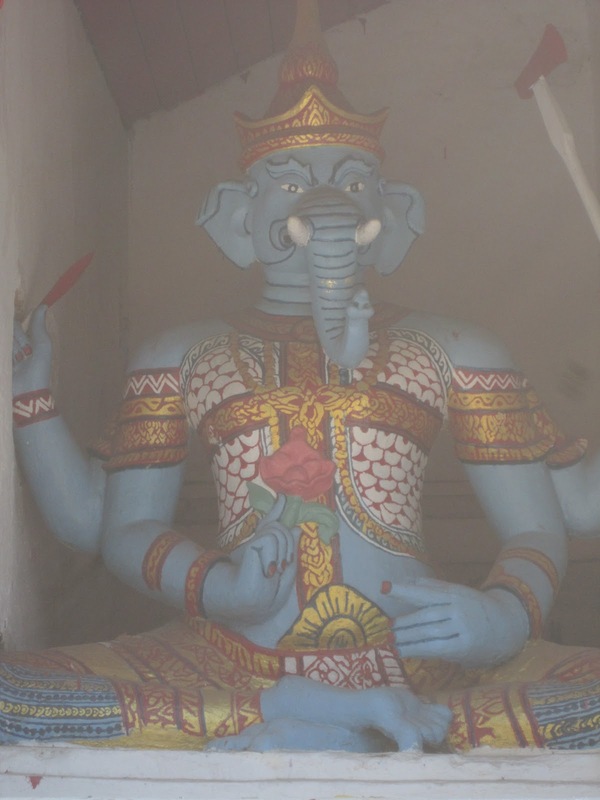 Each morning the mahouts at the Elephant Conservation Center in Lampang begin their day by paying homage to the shrine of Ganesha, the elephant-headed deity of both Hindus and Buddhists. There are several different stories that explain how Ganesha lost his head, none of them suitable for the squeamish. One might question his father’s choice of an elephant head as replacement, but it is generally not wise to argue with Shiva—you’re better off with the head of a pachyderm. A few minutes later I was introduced to my elephant for the day, Pang Jan Pen (Full Moon), a 54-year old female, that was described as both “stubborn” and “afraid of trucks.” Great. Her mahout was a joyful little guy named Peng; he had a startling resemblance to Ernest Borgnine. The first thing I learned was the basic commands in Thai that I was told Pang Jan Pen would understand. . . but not necessarily obey. I stood close to her, patting her, gazing into her gentle, dark eye, trying to work my charms on her, but I don’t think she was having any of it. Then it was time to climb aboard. There are several ways to mount an elephant, none of them easy. Peng patiently showed me how to perform each one and not so patiently hoisted my posterior aloft when needed. Once aboard I sat right behind Pang Jan Pen’s head, my knees behind her ears, my hands placed on her massive head. Wow! Sitting so high up there, looking down on miniature Peng, it was easy to feel like royalty. I could feel the awesome power of this animal even as she silently stood there unmoving. She was Ganesha incarnate; every obstacle would crumble before her. “Pai! Pai!” and some pushing behind her ears got Pang Jan Pen moving forward. Over the next several hours I rode my mount down roads and into the forest, over rugged trails. 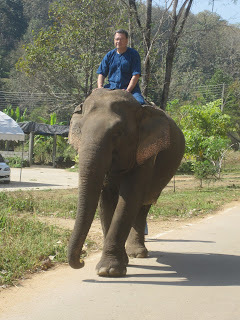 I would like to think that I was in complete control of my elephant, but I know better. Miss Pen was merely humoring me. And her real mahout, Peng, was never far away (thank Ganesha!). After awhile, though, it felt as though the elephant and I had agreed to work as a team. I could see the world as she saw it, as though looking through her eyes. I could feel her caution as she maneuvered over slippery rocks in a creek, could feel her happiness in cruising down the open road just like the world’s largest ’57 Chevy. And, of course, she became my legs as we merged into one creature—Ganesha-like. At one point we entered a lake to give her a bath. While I clung desperately to her ears, Pang Jan Pen submerged completely, the waters of the lake rising up to my chest, while Peng stood on the elephant’s back and scrubbed it. After her cool bath, I rode her back to the Training School where she would relax for the rest of the day and I would try to repair my leg muscles, stretched like rubber bands to the consistency of wet spaghetti. With the command “Tack long,” Pang Jan Pen rolled her trunk and dropped to her knees, her head lowered to the ground so that I could slide off it. “Dee mak, Pen,” I said, very good. Walking by the shrine to Ganesha, I murmured my thanks that he had, indeed, gone easy on me.